Awesomenauts Assemble! 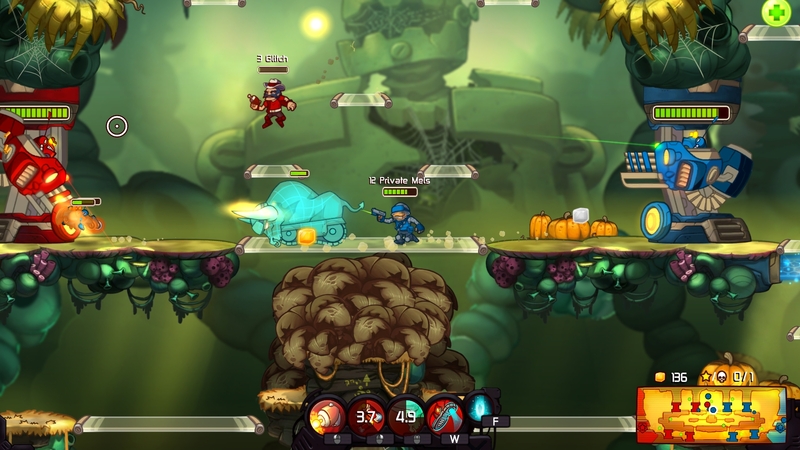 is an online arena game that looks like a 2D platformer but plays like a MOBA. It features creative music, cartoony graphics, challenging but fun gameplay, and controls perfectly on the PlayStation 4’s controller. I will admit, I’m not a huge fan of MOBA’s at all, in fact, I honestly hate them. They’re hard to get into, take forever to learn and get good at, and have terrible communities. Obviously, this is my opinion. There are lots of people who would disagree with me and I respect that. I just don’t like the genre. Awesomenauts Assemble! feels different though. It’s fun to play, challenging in a good way, and easy to learn. Every match I joined had friendly teammates who were willing to work together in order to win. This made me want to play more knowing that I had teammates who would back me up and help me learn the game. The game controls rather well with the DuelShock 4. Other MOBA’s feature tons of abilities that require a keyboard to perform, but Awesomenauts Assemble! is scaled down perfectly to make it feel almost natural with a controller. Traversing the maps were made easy with the ability to jump up through platforms and drop down through them. The only problem I had with the controls is that you could move your gun up and down with the thumbstick. This annoyed me because it seemed unnecessary and would get in the way at times. It was much easier to just jump and shoot then have to aim up slowly and line up the shot. The gameplay isvery simple. After selecting one of the many available characters, you spawn in a dropship and navigate your way down to the battle field. The maps are small/medium sized and feature tons of enemies, hazards, platforms and hiding places. There are eight turrets in total on the map. Four are yours and four are the other teams. There are two above and two below for each team. The goal is to fight your way through these turrets and the other team’s 3 players and minions to reach their drill. Once there, you have to destroy it in order to win. There are also creeps who are hostile to both teams. When they are killed, they drop a small amount of health. During the game, you can teleport back to your base and purchase upgrades for your character with currency collected while fighting. There are tons of upgrades to purchase like new abilities and increased health and damage. While not in-game, you can purchase skins for your characters and advance to different leagues based on your skill. The graphics of Awesomenauts Assemble! are very fun and cartoony. They aren’t dark and mystical like many other popular MOBA’s. They game is very colorful. It sort of draws you in and keeps you in a good mood. The music is also very fun. It’s different and creative. It’s like mixing a childhood cartoon with a popular, modern day MOBA. Awesomenauts Assemble! isn’t a game I would invest hours into. However, I wouldn’t mind starting it up to play with friends every once in a while. Part of the reason I wouldn’t play it a lot is because MOBA’s don’t keep me entertained like other genres. I get bored very easily playing a MOBA, and I’m usually not even interested in playing one with friends. Awesomenauts Assemble is different though. It’s fun and different enough to make me want to come back for more. For someone who loves all sorts of MOBA’s and is looking for a new one to play, try this game. For someone who doesn’t typically like MOBA’s and prefers AAA console games, I still recommend buying this. It’s challenging and fun, feels natural on a controller, looks and sounds appealing, and is even better with friends.